Batley's Alistair Leak runs at the Toulouse defence. Batley Bulldogs coach Matt Diskin vented his frustrations on match officials following his side’s 38-12 defeat at home to high flying full-time opponents Toulouse Olympique. Batley deservedly led 12-10 at half-time but saw key decisions go against them after the break, which starved them of possession and allowed Toulouse to run in five unanswered tries. A frustrated Diskin said: “I thought in the first half we were okay. I thought the second half was refereed with some quite obvious bias. “We have come across that in the last few weeks. Referees are refereeing full-time teams differently to what they are part-time teams. “You try to speak to the RFL department at Red Hall and there’s no response, they don’t want entertain you, so you’re left to try to deal with stuff yourself. “That’s not condoning the two players that were sin-binned and sent-off, mouthing at the referee is unacceptable and I’ll deal will that accordingly. “The first half I thought we were good. We could have taken some more opportunities and we had a couple of people step out of systems in defence, but we did some decent stuff. 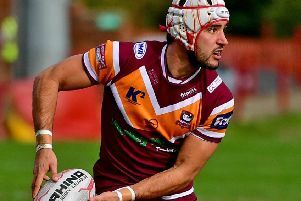 One key decision turned the course of the game when Batley were pulled up for a knock on, despite strong claims the ball was stripped in a tackle. “We started the second half and kicked out on the full straight away which puts us under pressure but a poor decision really turned the momentum. “Once that momentum changes, whether that’s teams working hard for it themselves or being gifted it by an official, it is hard to get back hold of.